Inside the house everything isn’t so calm, as a crazed arsonist sets the entire place on fire while thoughtful music plays on the soundtrack! Wait, hold on. Let’s get another look at the house. Yeah. It’s only one story. Why did you go crawling through the entire house when you could have just opened a window? Sealed the doors. He watches the family suffer and fall unconscious, then takes the wedges out of the door and leaves the house. Yes, for the record, the whole family died because they were too stupid to open a window when they saw that the hallway was on fire. Oh, and the guy is able to walk out the front door, take off his costume, and drive away in the car that was parked outside without any of the neighbours noticing. Ah, luck, you’re the best friend of the killer, aren’t you? The team goes over the stats – arsonists are all white males, and they never get caught. Of course, they’re not dealing with an arsonist here, they’re dealing with a serial killer who happens to kill people with fire. It’s a cop-out, which the show kind of acknowledges by saying that there exists no statistics to quote, because this guy is ‘one of a kind’. Which would be true, if the third-ever episode of Criminal Minds hadn’t been about a serial killer who loved to burn people, that they initially dismissed as a serial arsonist. Even more hilariously they try to tie a bow on it in the script by announcing that three weeks ago their ‘serial arsonist turned into a serial killer’. Except at this point they have no information that the guy had ever set a fire, yet alone done it serially, before killing two families. Even though they’re told that the mother only has a few hours to live Emily feels guilty about not telling her that her family’s dead. Greg’s happy to lie to her though, and they manage to get some information out of her – that the killer turned off the water at the curb, unhooked the fire extinguishers, and spiked the door. Also she noticed that the killer was dressed like a fireman, which is a key clue. When Mandy and Derek arrive at the scene they meet the fire chief, who already knows that their best suspect is a fireman who was at both fires. It’s nice that they’re avoiding the cliché of the obstructionist authority figure who won’t believe one of his own was involved, but since we’re dealing with a serial killer as opposed to a serial arsonist, it’s all a waste of time. 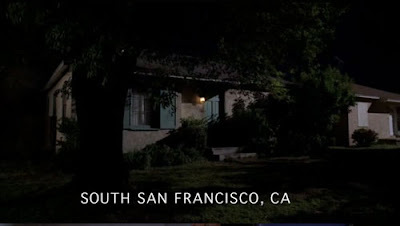 An even bigger waste of time is Derek’s re-enactment, where he theorizes that the killer blocked all routes of escape other than the front door, so that he could watch them die. No one mentions the windows. Look, I’ve only ever been in one house fire, and I didn’t have to go out a window or anything, but that was the first thing I learned about surviving a house fire. Use the route where the fire isn’t. If a door is hot, go out the window. They teach this stuff in kindergarten. I’ve seen cartoons about the importance of having an emergency ladder in every bedroom for god’s sake. And these folks were living in a one-storey house. Based on the fact that the car was a gold Taurus they assume it’s a company car, and use this information to guess that he’s a narcissist travelling salesman who loves to burn men who are more successful than he is. All of this is accurate, but will it any way help them catch the killer? Of course not. What will help? Identifying that all the targeted dads worked for companies who are guilty of polluting the water table, as listed on an environmental group’s website. This includes the newest victims, a family who is burned to death in their garage! So that guy’s clearly not screwing around, huh? Of course, since they’ve now got a list where all the victims appear, all they have to do is figure out which member of the group is doing the murdering. They drag the leader of the group down to the crime scene for an interview, and because he’s freaked out by the corpses they know he can’t be the killer. The environmental leader claims to know nothing about the fires, and refuses to help the team out. They massively harass him about the fires, which gives him no reason to help them find the killer. The team has a plan, though – dig into the leader’s life so they can find something they can use to blackmail him into helping. Ah, the FBI. That’s totally unlike the tactics that led to Ruby Ridge, isn’t it? According to the leader’s ex-wife he’s depressed because his career as an environmental cleanup specialist ran up against the evils of corporate malfeasance. Meanwhile the leader visits his lawyer and empties out his bank accounts. Is he preparing to run? Greg and Emily aren’t sure, so they follow him to his house and watch as he disbands his chapter of the eco-terrorist group. Luckily they were snapping all sorts of pictures, meaning that they almost certainly have the killer’s face in their camera. Wait, hold on a second – they suspect that the arsonist was there that night, and they know what kind of car he drives. Why didn’t they have the cops cruising the area surreptitiously, looking for a gold Taurus? Yeah, he threw a molotov cocktail at that guy, and sinc e the businessman was never taught to stop, drop, and roll, he’s killed. Or is he? We never actually find out, because this is a remarkably poorly-written episode. Once again proving that they care more about getting a good night’s sleep than solving crime, the team doesn’t actually get around to investigating the burning until the next afternoon. At least this has given Greg more leverage to use against the leader, who, as it turns out, is also dying of cancer! Hey, just like the alienated dad in the child-molester episode! Anyhoo, Greg swings by to have a conversation with the leader, and show him photos of the potential arsonist, asking him which member of his eco-terrorist team is the creepiest. Before identifying the killer the leader drops some creepy knowledge – he got cancer from working with Benzene, and now one of the Benzene cleanup sites he’d been working on is now going to have a school built on top of it! He points out who the likely arsonist is, then drives away. The team rushes to capture the killer, but the leader has beaten them to it! He’s called the killer and lured him away to the benzene storage facility that he’d been complaining to Greg about! It seems that the Leader has a plan – kill three birds with one stone: Get murdered by the arsonist (for the insurance), have him burn down the factory (so it will be condemned as a hazardous waste site), and have the arsonist get killed in the blaze (because benzene burns way hotter than his fireman suit can possibly handle). You know, I’ve got to say, I like the guy’s plan. And it totally works, too. The leader is so considerate that he even calls the fire department before setting the building ablaze! I’m sad this guy’s dead – he’s better at his job than the Criminal Minds team are at theirs. Except for a scene where Greg goes to visit the Leader’s son and mentions that his dad was a great guy. How sweet. Just a little – they were able to figure that the arsonist would likely be a cowardly wuss, which is the characteristic that allowed the leader to immediately identify which of his followers must be the killer. Oh, yes. In fact, it was their failure to do even the most basic surveillance (looking for the killer’s car around the meeting) led to the killer getting away, (possibly) killing someone else, and murdering the Leader as well. They found the eco-terrorist group based on a google search of what the victims had in common, and it’s hard to imagine anything more basic than that. 2/10 – I’d rate this higher if the team had actually caught the killer, rather than just tipping off the leader as to who it was so that he could take the law into his own hands. And let’s not forget that they didn’t really need to involve the leader in the equation at all (a risky proposition since he might have been involved or done something crazy… oh, wait…) – they could have simply run the photos through their DMV computers and checked which one of them drove the golden Taurus that they associated with the killer. 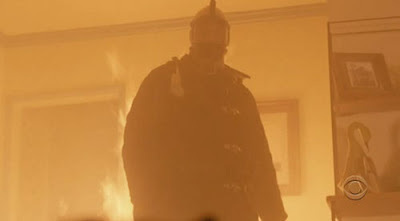 Actually, when doing the walk through theory, Derek pours gasoline in front of a window, implying there were hot spots on all windows, still only leaving the front door since windows and back door are in flames. Also, in the beginning they show you window curtains and later a window, engulfed in flames. HOWEVER, assuming the bedrooms were not inside rooms, they should have used those windows, as the quickest exit. As for the lack of stop/drop/roll wile we all know that, it is rarely shown in the fictional showings. But there are even real instances as well where people seem to forget those rolls. Whose to say the team is suppose to always be the true hero in the end? This is something I REALLY want addressed. 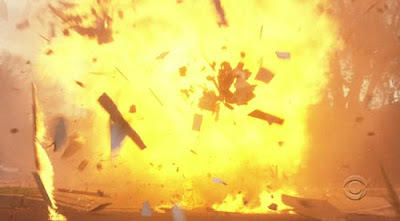 In the episode when Hotch talks to his brother, Sean, Sean accuses Hotch of having a high-pressure career that led to a heart attack at 47. Yet in this episode he says that his dad had terminal lung cancer. Now... I'm willing to stretch it a little and say that maybe Hotch's dad was on his way out with the lung cancer when he died of a heart attack, or maybe Hotch was just saying that to identify with him. We're in season eight, and Hotch's backstory with his father and the possible abuse alluded to in 1.8 had NEVER been covered. How disappointing and odd that CM would miss an opportunity to emphasize how tragically tormented, yet noble, the protagonists are. Great, though cynical, reviews! Oh, thank you! The window thing in the beginning is SO obvious I was almost sure that son is the bad guy trying to kill his parents by making them crawl through the fire. People do stupid things when they panic but walking directly into the flames? Self preservation instinct generally would not allow this, especially if it's clearly not the only way to survival. I had to go back and check the scene where son enters parents' bedroom - the only source of light is fire OUTSIDE of the DOOR. We hear cricket sounds while parents are sleeping. Everything implies there is a window in the room and there is NO fire outside of it when son enters the room. This could have been fixed so easily by letting viewers see that there is no window in the room or explicitly showing that there is fire outside of it.. Anything. Lack of content... but for why? Live-noting A Nightmare on Elm Street!